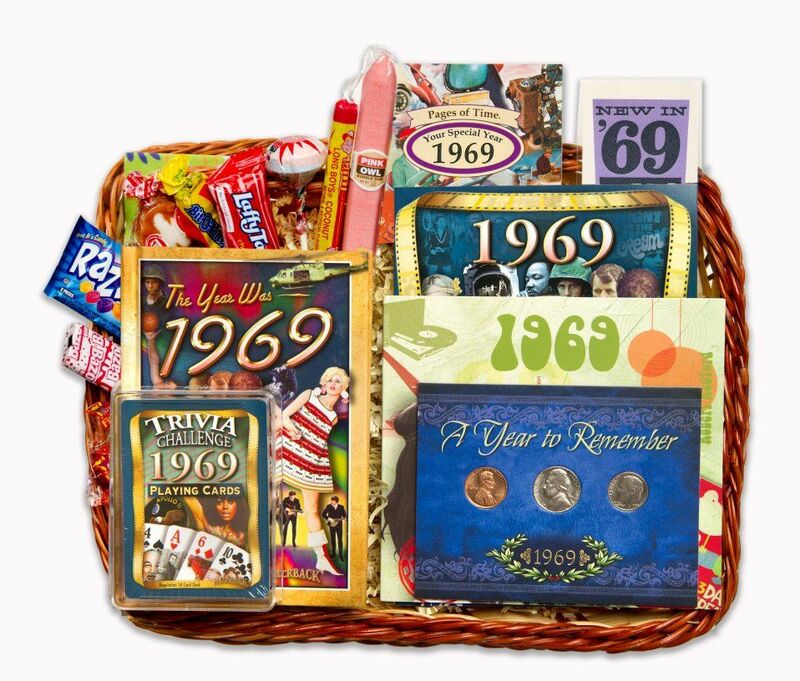 50th Anniversary Gift Basket for 1969. This top selling custom 50th gift basket makes an astounding gift for a either an anniversary or a birthday. We have them. It�s the perfect gift for such an important milestone! a year Circulated Coins Set consisting of the penny, and the dime and the nickel from that year. These products are fit tidily in a bamboo basket that can be re-used another time. We then shrink wrap the box to keep everything together. We place an elastic gold ribbon around the outside and attach the card. The basket measures 11.5" long and is 8.5" wide and contain nine year themed gifts inside it. Many of the gifts are flat, like a minibook, CD or DVD. For an additional $5.00, you can choose to personalize the envelope that goes with the greeting card with a message that is 50 characters in length. This message is placed on a shiny gold seal that really sets the basket off! Note: Items in basket may be arranged differently than shown in the picture for shipping purposes. Makes a wonderful 50th anniversary gift or 50th birthday gift! See also our other 50th wedding anniversary gifts. What WE say about this gift basket: This is a unique 50th anniversary present that no one else offers on the market. No other store offers a collection of memorabilia in one elegant package to mark this golden anniversary. We have tried to include products that are both entertaining, like the trivia and songs, and also informative for those that really are interested in facts from their wedding year. The coins alone are worth the price the gift basket. With the price of silver coins these days, this golden anniversary gift basket is an excellent value for the price. We haven't seen another gift store that offers the opportunity to personalize a 50th anniversary gift basket either. For a small extra fee you can say whatever you want to to say to them on the gold seal. Most people opt to include the couple's names, but you can also make a short greeting if you choose to, like Happy Anniversary Mike & Anne. You could assemble all these 50th anniversary gifts on your own to create your own gift basket, but we have taken steps to save you time and money by having it all ready for you to purchase. We will ship it out promptly for your special party. Super satisfied with this golden anniversary gift. We got to personalize it, and the mementos from the year really made it a special present to give. Great gift idea and fast service. Thank you! So unique and fun to talk and remember fun times you have forgotten. i was amazed - placed the order on monday about noon - recvd notice that it had left new york on fed ex..and it was delivered, as promised, on friday!! didn't actually see the gift, but recipients said it was great and how much they enjoyed the top 20 songs, etc. i'd order again from seniorstore.com...in a heartbeat!! tysm for the great service! As I have read other review on this, we also agree that this was awesome and our parents were excited when opening. The memories started flowing for them. They went above and beyond to help me with a missing delivery. This was completely FedEx that messed up but the senior store made sure I had a replacement in time for the anniversary celebration. The 50th anniversary gift basket was a big hit. I made sure that everyone knew where I got it and encouraged them to consider this site for their future events. Thank you Senior Store for making this happen. A good idea, but definitely not worth $100.00! It came in a tiny basket and was just a few small items. Had to buy a larger basket and more items from another store to make it worth giving as a 50th anniversary gift. SeniorStore.com's comment: Hi Bruce, Thanks for the input! Physically, the basket measures 11.5" long, and 8.5" wide, but it contains 9 different year themed gifts inside the basket. Many of the items are flat, like the DVDs, CDs, ec. but it is an excellent value when you total up the retail value of these items individually. Hope that helps explain. My sister and brother-in-law were absolutely delighted with my selection of the 50th Anniversary Gift Basket. They called the day after just gushing about what a marvelous gift I had chosen for them. Turns out I was their flower girl all those years ago. I'm now 57 and was delighted that I found Senior Store in the nick of time to purchase the wonderful gift basket. My sister and brother-in-law now have yet another wonderful way in which to always remember July 27, 1962 thanks to the Senior Store and their wonderful memorablia. Thanks again Senior Store, I would gladly make additional purchases from your company in the future. Recipients loved it. Son in law loved so much he got info to order one for his parents. Best compliment I know. my in-laws loved this gift! they tore it open and had a great time re-calling old memories!! I looked for months for my parents 50th wedding anniversary gift. They loved this basket filled everything from a cd to candy from 1962! 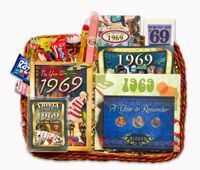 Choosing a 50th anniversary gift basket as your gift is the best and most personal golden anniversary gift you can give. It's an upscale choice which pulls together all the best golden anniversary gifts into one special package. It is a great combination of nostalgia blended with thoughtfulness of the day. You can also make your own 50th wedding anniversary gift basket by buying things separately, or making your own nostalgic gift, and assembling them into a wicker basket with your own flair. If you choose to create your own, remember to decorate it with a bright gold ribbons, since gold is the special color for that anniversary. If you have any questions about our gifts, feel free to ask.